Saturday, Januaray 24, 8 p.m., Ancient Future World Jazz Trio featuring Matthew Montfort (scalloped fretboard guitar), Patti Weiss (violin), and Arshad Syed (tabla), The Jazz House, 3192 Adeline Street, Berkeley, CA. Partial benefit for The Jazz House Children's Music Program. Doors open at 7:30 p.m. $8-15 sliding donation. Contact The Jazz House Business Office at 415-846-9432. Friday, January 30, 2004, 8 p.m., Ancient Future World Jazz Trio featuring Matthew Montfort (scalloped fretboard guitar), Patti Weiss (violin), and Arshad Syed (tabla), Pena Pacha Mama, 1630 Powell near Union, San Francisco CA. Tix: $10. 415-646-0018. Friday, February 6 and Saturday February 7, 8 p.m., Ancient Future Sitar/Guitar Jugalbandi, Indian classical and fusion with Pandit Habib Khan (sitar),Matthew Montfort (scalloped fretboard guitar), and Arshad Syed (tabla), Sunnyvale Community Center Theatre, 550 E. Remington Dr., Sunnyvale, CA. Contact Sunnyvale Community Center Theatre at 408-733-6611. Wednesday, February 11, 2004, 8:30 to 11:30 p.m., Ancient Future Organic Trance Trio with Matthew Montfort (scalloped fretboard guitar), Salah (Arabic percussion), and Alan Tower (didjeridu) and Special Guests including Founding Member of Ancient Future, Mindia Devi (flutes, gamelan), 19 Broadway Niteclub, 17 Broadway Blvd., Fairfax, CA, Adm: $10. Information: (415) 459-1091. Ancient Future returns exactly 25 years later to their birthplace! Ancient Future's first show was Feb. 11, 1979, in Fairfax at the Sleeping Lady Cafe. Saturday, March 20, 7 p.m, Ancient Future Trio with Matthew Montfort (scalloped fretboard guitar), Patti Weiss (violin), Emam (tabla), and special guest dancer Sapphira, Spring Equinox New Moon Dance, John Finn Mansion, 160 Miller Ave, Mill Valley, CA. Park on Miller Ave or in Mill Valley Town and walk. $15 Donation. Potluck. 415-497-6216. 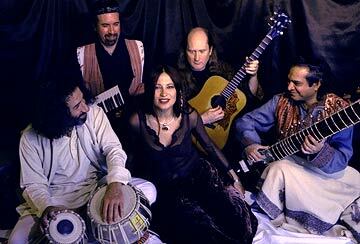 Saturday, March 27, 2004, 7:00 p.m., Ancient Future Trance Songs Ensemble featuring Irina Mikhailova (vocals), Matthew Montfort (scalloped fretboard guitar), Doug McKeehan (keyboards), Emam (tabla), and Sapphira (world dance), Lake Tahoe Community College Theater, One College Dr., South Lake Tahoe, CA. Adm: $8 adults, $4 for child/senior at door or for advance tickets, contact Peggy Aguilar, Tahoe Arts Project, at 530-542-3632. Friday, April 23, 2004, 7:30 and 10 p.m., Ancient Future Organic Trance Trio, Pena Pacha Mama, 1630 Powell near Union, San Francisco CA, Tix: $10. Penultimate Fridays Fusion Fun Series. See a different lineup of Ancient Future each month! For info call 415-646-0018. Friday, May 21, 2004, 7:30 and 10 p.m., Ancient Future Trance Songs Trio featuring Irina Mikhailova (vocals), Matthew Montfort (scalloped fretboard guitar), and Salah (Arabic percussion), Pena Pacha Mama, 1630 Powell near Union, San Francisco CA, Tix: $10. Penultimate Fridays Fusion Fun Series. See a different lineup of Ancient Future each month! Friday, May 28, 2004, 7:30 p.m., Ancient Future Organic Trance Trio with Matthew Montfort (scalloped fretboard guitar), Salah (Arabic percussion), and Alan Tower (didjeridu), City of Cloverdale Friday Night Live, Cloverdale Arts Alliance, Outdoors, Downtown Cloverdale, CA. FREE admission. Just come to downtown Cloverdale. Saturday, June 12, 1:15 p.m., Ancient Future Trance Songs Quartet featuring Irina Mikhailova (vocals), Matthew Montfort (scalloped fretboard guitar), Doug McKeehan (keyboards), and Salah (Arabic percussion), Health and Harmony Fair, Center Stage, Sonoma County Fairgrounds, (directions), Santa Rosa, CA. Contact Health and Harmony at (707) 547-9355, email info@harmonyfestival.com, or visit Health and Harmony Fair. Saturday, June 12, 9:15 p.m., Ancient Future Trance Songs Quartet featuring Irina Mikhailova (vocals), Matthew Montfort (scalloped fretboard guitar), Doug McKeehan (keyboards), and Salah (Arabic percussion), Health and Harmony Fair, Saturday Night Techno-Tribal Community Dance, Sonoma County Fairgrounds, (directions), Santa Rosa, CA. Contact Health and Harmony at (707) 547-9355, email info@harmonyfestival.com, or visit Health and Harmony Fair. Friday, June 18, 2004, 8 p.m., Ancient Future Trio with Matthew Montfort (scalloped fretboard guitar), , Emam (tabla), and Sapphira (world dance, violin), Pena Pacha Mama, 1630 Powell near Union, San Francisco CA, Tix: $10. Penultimate Fridays Fusion Fun Series. See a different lineup of Ancient Future each month! For info call 415-646-0018. Saturday, June 26, 8 p.m., Ancient Future Sitar/Guitar Jugalbandi, Indian classical and fusion with Pandit Habib Khan (sitar),Matthew Montfort (scalloped fretboard guitar), and Arshad Syed (tabla), UCO Lick Observatory, Main Building Hall, Mount Hamilton, CA. Contact: Lotus Baker at 408-274-5061. Friday, July 23, 2004, 8 p.m., Ancient Future World Jazz Trio featuring Matthew Montfort (scalloped fretboard guitar), Patti Weiss (violin), and Arshad Syed (tabla), Pena Pacha Mama, 1630 Powell near Union, San Francisco CA, Tix: $10. Penultimate Fridays Fusion Fun Series. See a different lineup of Ancient Future each month! For info call 415-646-0018. Saturday, August 7, 9:00 p.m., Ancient Future Bansuri/Guitar Jugalbandi, Nepali fusion with Manose Singh (Nepali flutes), Matthew Montfort (scalloped fretboard guitar), and Aharon Wheels Bolsta (tabla), Caspar World Folk Festival, Caspar Rd, Caspar, CA. Contact Michael Potts at 707-937-5085. Friday, August 20, 2004, 8 p.m., Ancient Future Indo-Persian Fusion Trio featuring Matthew Montfort, Mohammed Nejad (Persian multi-instrumentalist), and Debopriya Sarkar (tabla), Pena Pacha Mama, 1630 Powell near Union, San Francisco CA, Tix: $10. Penultimate Fridays Fusion Fun Series. See a different lineup of Ancient Future each month! For info call 415-646-0018. Thursday, September 2, 2004, 6 p.m., Ancient Future Organic Trance Trio with Matthew Montfort (scalloped fretboard guitar), Salah (Arabic percussion), and Alan Tower (didjeridu), California State Fair, California State Fairgrounds, Sacramento, CA. Contact California State Fair at 916-263-3010. Monday, September 6, 2004, 11 a.m., Ancient Future Organic Trance Trio with Matthew Montfort (scalloped fretboard guitar), Salah (Arabic percussion), and Alan Tower (didjeridu), Sausalito Art Festival, Sausalito, CA. Contact Sausalito Chamber of Commerce at 415-332-0505. Friday, September 10, 2004, 9 p.m., Ancient Future Arabic Fusion with Matthew Montfort (scalloped fretboard guitar), Mohammed Nejad (Persian multi-instrumentalist), Salah (Arabic percussion), and Alan Tower (didjeridu) and Shoshanna, (2004 Belly Dancer of the Year), Trinity Tribal Stomp, Hayfork, CA. Contact Drew Franklin at 530-623-2656. Saturday, September 25, 2004, afternoon TBA, Ancient Future World Jazz Trio featuring Matthew Montfort (scalloped fretboard guitar), Patti Weiss (violin), and Arshad Syed (tabla), Peace Festival, Speedway Meadows, Golden Gate Park, San Francisco, CA, Contact Da Vid at (415) 381-2644. Sunday, December 12, 2004, 1:30 p.m., Ancient Future World Jazz Trio featuring Matthew Montfort (scalloped fretboard guitar), Patti Weiss (violin), and Arshad Syed (tabla), 34th annual KPFA Community Crafts Fair, The Concourse, 8th & Brannan Streets, San Francisco, CA.. Adm: $8 entry, $5 seniors or disabled, under 17 free. Benefits non-commercial KPFA Radio 94.1 FM. Lark In The Morning World Music & Dance Celebration August 2004, Mendocino, CA. Matthew Montfort of Ancient Future teaches World Rhythms For All Instruments: increase your rhythm skills by learning rhythms Of Africa, Bali, And India, World Music For Guitar: explore Indian Raga and other world music forms on guitar. Register Online. Camp fills up quickly. Monday, March 22, 2004 through Friday, March 26, 2004, Tahoe Area School Assemblies, Time and Locations TBA, Tahoe Arts Project, South Lake Tahoe, CA. Contact Peggy Aguilar at 530-542-3632.